Gene therapy is a promising yet complicated way of replacing defected or mutated genes. Although, this form of treatment hasn’t been made available for the general public it has moved from the research stage to clinical trials for a variety of diseases. In most cases, gene therapy is used in an attempt to cure cancer diseases (64.4% of all clinical trials: data collected in 2007). Several types of cancer diseases have been targeted including lung, skin, urological (urinary tract system) and neurological (nervous system). Cystic fibrosis is a monogenic (resulting from changes in one gene in all of the body) disease that affects the respiratory, digestive and reproductive systems. A build up of mucus in the lungs can lead to harmful lung infections. It is the most common inherited disease in Europe and the USA. The life expectancy of someone suffering from cystic fibrosis is under 40 years. This is the reason for Cystic Fibrosis to be the main focus for gene therapy. How Gene Therapy works (simple explanation)? The defective gene causing the problem or disease is identified. The site of the affected tissue or muscle is targeted and pinpointed, sometimes the defective gene is ‘silenced’ or cut out using an enzyme. A working gene must be obtained. The working gene is put into the gene via the use a vector in a virus. The future for gene therapy is bright, several research journals have shown positive results. Genetics Home Reference – Your guide to understanding genetic conditions. 2014. [online] Ghr.nlm.nih.gov. Available at: <http://ghr.nlm.nih.gov/&gt; [Accessed 17 Apr. 2014]. Ginn, S., Alex, er, I., Edelstein, M., Abedi, M. and Wixon, J., 2013. Gene therapy clinical trials worldwide to 2012–an update. The journal of gene medicine, 15(2), pp.65–77. Learn.Genetics.utah.edu. 2014. [online] Learn.genetics.utah.edu. Available at: <http://learn.genetics.utah.edu/&gt; [Accessed 17 Apr. 2014]. WHO | Genes and human disease. 2014. [online] Who.int. 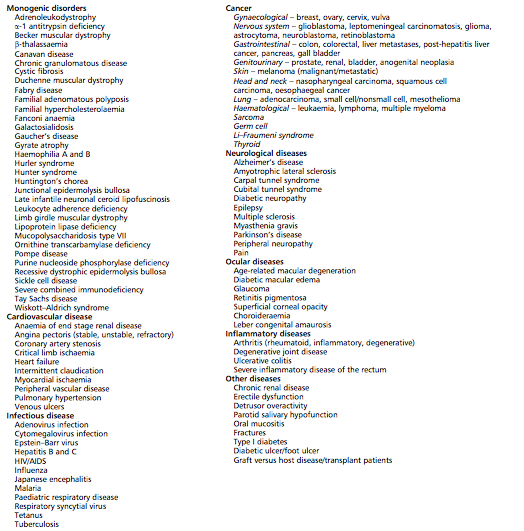 Available at: <http://www.who.int/genomics/public/geneticdiseases/en/index2.html#CF&gt; [Accessed 17 Apr. 2014].